About a month ago, I had my very first acupuncture treatment (ever!). For years now I’ve heard and read about how helpful acupuncture can be, especially for symptoms that don’t always respond well to traditional Western medicine. But I was so put off by the whole idea of getting stuck with a bunch of needles, I never tried it. Besides, before this dance with cancer I was really darned healthy and never felt a real need for acupuncture. When my discomfort from the “hand and foot syndrome” (a nasty side effect of Xeloda) was enough to keep me from doing things I enjoyed, a fellow yoga student, who also happens to be a well respected acupuncturist, offered to treat me in hopes of relieving some of the chemo side effects. I was reluctant, but my pain was great enough to get me to go. Now, five treatments later, I’m so glad I kept that first appointment! So, I’ve found myself in the unlikely role of telling everyone I meet how great acupuncture is. 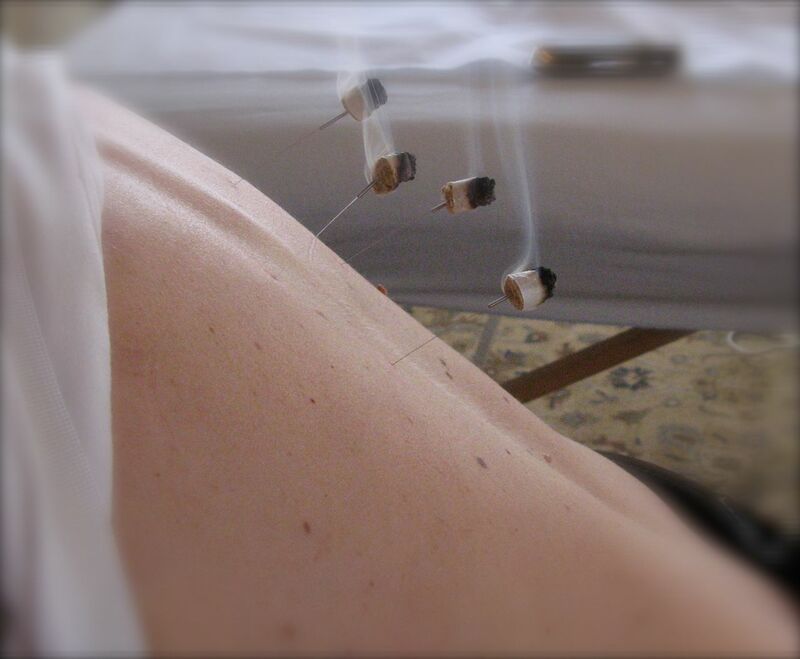 Seems like time to post a blog entry about this whole acupuncture thing. Look closely - there are needles in my back! Second: It’s not about the needles. At my very first appointment Leah told me, “I don’t have to use needles on you.” She took my pulse at several points on my wrists and throat. She applied pressure with her hands to my shoulders, back and hips. And then, when I was comfortable and she decided she’d like to try the needles, it was really no big deal at all. I was nervous enough before she inserted the first one to jump a little when her hand touched my back (before the needle even came close…). But then I didn’t even notice when the needle itself went in. Since that first time, if I feel anything at all, it’s as if a finger thumps me lightly. Usually it’s not even that much. Once in while (infrequently) I’ll feel a tiny poke or pinch that happens briefly and then it’s over. It’s not nearly as bad as having blood drawn – not even close. Third: It’s so soothing you won’t believe it. I tend to feel cold more often than not (except when I’m having a hot flash – which is a new phenomenon for me – but afterward I go right back to feeling cold). So when she heated up needles on either side of my spine I was in heaven. For the first time in ages my spine felt warm and supple, not stiff and achy like is has while I’ve been in treatment for cancer. She uses something called “moxa” (an herb that’s applied externally and burned like incense). Apparently, using the moxa together with the needles allows you to relax even more. Now, I look forward to this part of the session more than any other single thing she does. The overall experience of acupuncture has turned out to be very comforting, but the heated needles are the bomb! Fourth: The healing effects are almost immediate. I usually leave Leah’s office feeling light and peaceful – even if we’ve talked during the entire session. Something about the treatment calms me immediately. And Leah has said my “pulses” have gotten better with each visit (I’ll just have to trust her on that one). I feel certain I’m getting benefit from having these acupuncture treatments, but – in answer to those who ask if it’s “effective” or not? – it’s something I experience as being very healing, and that counts as “effective” in my book! Acupuncture is also a very individual experience. It may not be for everyone. I’m normally kind of reluctant about things I don’t understand. But, in this case, I can say without any hesitation that acupuncture has helped me better deal with the side effects and stresses of cancer treatment. And for that I can only be grateful! Remember Faye, our Irish Setter? We carried her in to the vets one day after she got blind-sided by one of the Berners. Dr. Mecenes was on duty, and newly graduated from an acupunturist course. He inserted a few needles in Faye’s knee, and we were amazed to watch one of them begin to spin. It was years ago, but I remember clearly how the pain left her eyes in a matter of minutes, and the dog we carried in got up and walked happily back to the car. Been a believer ever since and am so glad you found Leah and her magic needles. Way cool shots of you with needles in your back. You are amazing at sharing your experiences. I spoke with my KW housemate Michael and he says he follows your blog and has drawn much inspiration from it. Just by being honestly and genuinely ourselves…we bless each other. And you my sister…are a blessing in my life. And that came from all 4 of the voices in my head….ha ha.